Exceptional Teachers: Educate!’s Teacher Training class of 2010 — Educate! 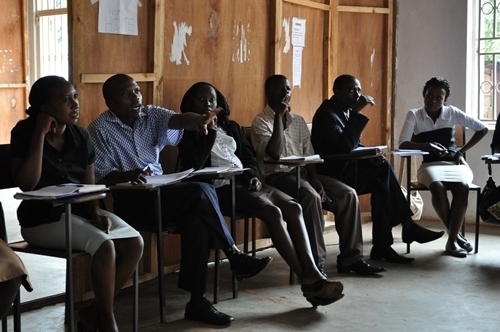 | Preparing youth in Africa with the skills to succeed in today’s economy. Every year, Educate! holds a five week Teacher Training course open to any Ugandan interested in learning more about Educate!’s curriculum and methodology. We are now coming to the end of this year’s training and Maggie, our Deputy Program Director, writes about what has happened so far. Despite being one of the most known professions in the world, teaching is still one of the least understood. We have all had teachers in our lives but we will have had few, if any, exceptional teachers. Exceptional teachers are ones who make us forget that we are sitting in a classroom and absorb us into the material. They are the ones who inspire us to read more on our own and continue to ask questions, even after the lesson has finished. Exceptional teachers are the ones who uncover our passions and spark our interests. What is it that makes these teachers exceptional? Has anyone ever stopped to think about it, package it and promote it? Has anyone ever tried to teach people how to teach? This is exactly what Educate! is doing this year with our Teacher Training Course. 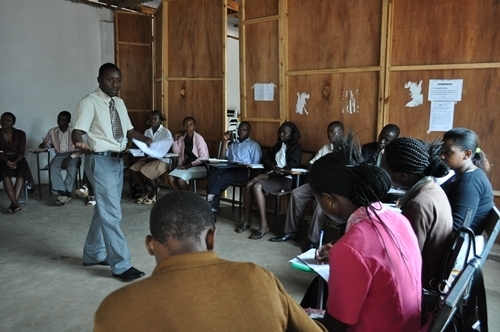 The course aims to teach people how to teach. Teach in a way that inspires, engages, and leads students to form a deeper understanding of themselves and their relationship to the world. Teachers who can do this are the most equipped to empower students. Educate! offers this five week Teacher Training course every year, a for-profit venture that teaches people how to teach using the Educate! method. Educate! believes education must include three key components in order to be exceptional: it must be practical, allowing students to learn through experience; it must be community oriented, preparing the leaner to create positive change in their communities; and it must be student-focused, empowering the student by engaging them and developing their critical minds. Our Teacher Training Course focuses on a teaching method that incorporates all three of these qualities. Adapted from the Teach for America principles, the Educate! Teacher Training Course teaches community facilitators and professional educators how to create a classroom dynamic that is interactive, practical, and community focused. This year we are team teaching. I have partnered with James Katumba, Educate! mentor and teacher and also our current Program Development Coordinator. On day one, we stood in front of our class, and the trainees were simply names on a piece of paper. We reviewed the applications and, through a competitive process, handpicked the top twenty, whom we felt had the highest potential as community leaders and change makers. From this group of twenty, Educate! will select four people to be Educate! mentors and part of our teaching staff. As the weeks have passed, we have come to know our candidates personally and their wide variety of personalities. There are shy trainees, who amaze us with their public speaking skills, argumentative types, who challenge us in discussions, and team leaders, who take charge of group work. What has been the most unexpected, though, is that, across the board, each one of our trainees has experience working with the community. This has created an almost ideal starting point as we link our conversations back to the idea that an empowering education is essential for development. Our students this year have proven that questions about sustainable development, poverty alleviation, environmental conservation, and community mobilization are familiar to them. Yet, still, as we teach techniques that foster leadership, we watch them grow. After only three weeks, they have each gained a clearer understanding of their goals, shown incredible improvements with presentation and facilitation skills, and even gotten to the point where they give James and me constructive criticism on our own teaching methods. Comments like “incorporate more activities” and “make better use of the board” show us that we are succeeding. During Teacher Training Course, James and I have watched as our students learn how to use teaching as a means of empowerment. We hope this course will mold our trainees into something great, something, which, if we are lucky, a student might someday say is exceptional.